I just got back from running another one of the monthly Magnuson Series races– the Spring into Action 5K. Here is my very short race report. 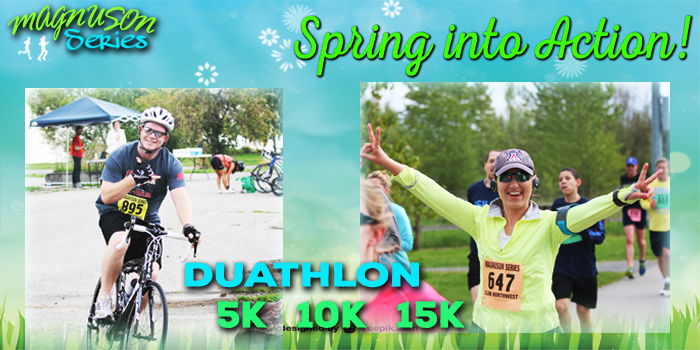 This is the only race in the Magnuson Series that includes a duathlon. Even though I’m a duathlete, I can’t see myself riding this race as most of the bike leg is on the (fairly narrow) Burke-Gilman bike path. This isn’t exactly a safe course for going all out on a bicycle so I opted for the 5K instead. I finished about 30 seconds faster than last month, which is a decent improvement but I still have a long way to go. Then again, I also did a pretty good job of sabotaging my race. I have another post brewing which describes some new thoughts I have for training older athletes. The bottom line is that we need more variety in our training than the younger guys. This meant a hard set of uphill sprints with my team on Tuesday. When a coach tells a speed-starved ex-sprinter like me to sprint about 150 yards up a hill, he should know that I’m going to hit it hard. Very, very hard. What I didn’t know was that there would be 25 repeats up that hill. Next morning, I could barely walk. My post-exercise muscle trauma was probably due to both the effort level I put in (I really hit them hard) and the novelty of doing sprints after a month of only mile repeats. As strange as it sounds, I was encouraged by my muscle soreness and thought, “oh wow, I need more of this on a regular basis…” One off day turned into two days off– partially out of laziness and partially out of too much work. An easy bike ride on Thursday (again, too much work) and an easy run on Friday. Not exactly the perfect taper for a race. Last night was also a late evening at the ballet. I woke up this morning with too little sleep and an upset stomach. Like last week, I jogged the 2 miles from my house to the race start. I was running late so I was a bit of a nervous wreck when I started. I grabbed my number, crumpled it up, and attached it to my triathlon belt. Within about a minute, the gun went off and we were racing! Running out on the first part of the race, I was just settling in. I wanted to run hard but I wasn’t going to kill myself. We ran up the first hill and I could see a familiar running style in front of me. As I pulled up, I recognized it was my friend Elly. I tried to start up a conversation but she was all business in this race so I kept going. After we passed the first mile marker, I started working a bit harder. Before this point, my breathing was pretty gentle and easy– now it was getting a bit harder. Steadily hard, but not harder than a lot of my training efforts. The field started stretching out and I started to zero in on one or two people in front of me that would serve as my targets for the rest of the race. After the second mile marker, I picked up the pace just a little bit. It was strange that I always felt like I had another gear that I just wasn’t willing to use. I was hurting but not nearly as much as most 5K’s. It wasn’t until about 200 meters to go (well within the last straightaway) that I finally switched into that last gear. But even after I finished, I was a bit surprised at how much I had left. It certainly didn’t feel like an open 5K– much more like the effort I would put into the opening 5K of a local duathlon. By contrast, last month’s race was a much deeper struggle. I finished with a time of about 21:03 according to my Garmin, which put me at about 6:46 per mile. A nice improvement over my last race, but what fills me with confidence is that I know that my fitness level is miles above last month. Had I approached this race a bit more carefully, I’m utterly confident that I could have gone significantly faster. So what have I done to dramatically improve my fitness since last month? First, I started running mile repeats at the track in a “broken” format. I’ll talk about this in my upcoming post, but the idea is to run these mile repeats HARD. I think mile repeats are just about the perfect workout for a strong 5K. Anything shorter than 1200 meters doesn’t focus enough on the aerobic component and anything longer than 2000 meters doesn’t focus enough on speed. Second, in order to provide enough recovery, I completely backed off the gas on my other runs. So now my running pace on easy runs is never faster than 10:00 per mile and I walk frequently. To hold me to the slower paces, I set my heart rate monitor to beep at me if it goes over 110 beats per minute. Now that another race is over and my base of mile repeats is in good order, my training will shift slightly. I intend to alternate weeks of running mile repeats with weeks of more intense speedwork. These other workouts will either be shorter 400-800 meter efforts on longer recovery or Tabata style workouts. The weeks when I’m running mile repeats will be slower because my recovery times between each repeat will be relatively short (as low as 2 minutes). Again, more details in an upcoming post.